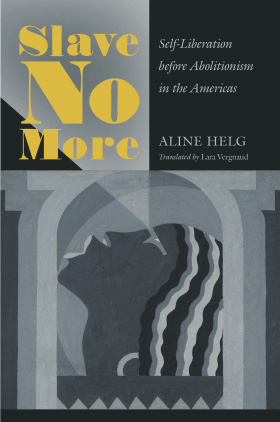 Our series on new books in labor and working-class history continues with Aline Helg’s Slave No More: Self-Liberation before Abolitionism in the Americas, which UNC Press is publishing in English this month. Helg, a professor of history at the University of Geneva, answered questions from Jacob Remes. There has been growing attention to self-emancipation. What does looking at self-liberation from a continental perspective—beyond the confines of a particular country—teach us about slavery and liberation? A focus on self-emancipation challenges the traditional, top-down narrative of the abolition of slavery still prevailing in the general public. It shows that well before Enlightenment and the Revolutionary Era, when slavery seemed indestructible, many enslaved men and women managed to free themselves, individually or collectively. It demonstrates that they did so through a variety of strategies, from flight to legal self-purchase, military service, and more exceptionally revolt, generally adapting the means to liberate themselves to their context. Flight and marronage were especially successful up to the mid-eighteenth century, when most of the American continent and the mountainous areas of the Caribbean islands were not colonized by European settlers. In the early stages of slavery, self-purchase was possible everywhere, but with the development of slave plantations, it was progressively restricted in the British, Dutch, and French colonies, whereas it remained legal in Spanish America and Brazil as well as in the Iberian Peninsula, where slave laws continued to follow the Roman law. Revolt, I discovered, was quite rare, because the conditions to secretly prepare a movement widespread and strong enough to win over armed militias and regular troops were almost impossible to meet. The 1791 Saint-Domingue Revolt could spread and take root because the colonial order had been destroyed by the French Revolution—but we should remember that it took thirteen years for the African and creole insurgents to definitively defeat slavery and colonialism, in 1804. Moreover, if enslaved people seldom openly revolted, it was because they knew that the chances to survive cruel repression were slim. However, my book documents their readiness to seize any opportunity that let them envision freedom. During the U.S. Revolutionary War, tens of thousands of enslaved men, women and children fled their masters to take refuge with the British forces in response to a vague promise of freedom. Once abolition was in sight, slaves responded massively. Think about the one million enslaved African Americans who escaped their owners in the South to gain their freedom by joining the Union’s troops during the Civil War: one out of four in the enslaved population then made that choice! Similar mass movements to freedom also happened during the Ten Years War in Cuba, or after the first states abolished slavery in Brazil. Indeed, enslaved people actively participated in the abolition of slavery. 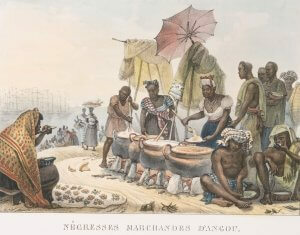 “Nègresses marchandes d’angou.” [Black women selling angu (polenta)], Brazil, ca. 1820 by Jean Baptiste Debret, Voyage Pittoresque et Historique au Brésil. From the Miriam and Ira D. Wallach Division of Art, Prints and Photographs, New York Public Library. 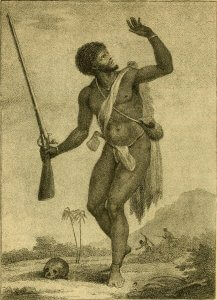 Tell us about marronage and flight as methods for self-emancipation. Should we think of these as collective or movement activities, or were they individual choices to escape? Flight is a natural antidote to captivity. I am sure that each enslaved man, woman or child repeatedly thought about flight and at some point attempted to escape. In some cases, it was a short-lived individual flight with the previous knowledge that it would result in harsh punishment, in order to enjoy a night or a few days of freedom, alone or in the company of a loved one, a child or a relative. Some individuals planned to escape slavery for good, sometimes with help along the way, or in total isolation. Some flew alone to hide among the free urban population of African descent, others joined boat crews, settled in forests, in swamps, or on the fringes of colonized territories, still others joined bandit groups or maroon communities established in the hinterland. Sometimes entire families fled together. In other cases, groups of enslaved workers of a mine or a plantation mutinied, killed their overseers and escaped together to settle in the interior or with preexisting runaways. In several regions in Brazil, notably, fugitive slaves created indomitable networks of wandering gangs and quilombos (runaway communities) tied to contraband. In addition, there were the massive movements of flight that I have just mentioned in war times. Of course, flight was often unsuccessful. Many runaways were caught by slavehunters, militiamen, or soldiers and brutally punished or killed, and some maroon communities were destroyed. But throughout the Americas the continuous new legislation and reorganization of the security forces supposed to repress marronage show that flight always threatened slavery—and that it hastened its abolition, notably in the United States and Brazil. Did men and women have different access to various strategies for self-emancipation? How did gender shape the choices that enslaved people made? Fugitive slave. From: Narrative of a five years’ expedition, against the revolted negroes of Surinam, in Guiana, on the wild coast of South America; from the year 1772, to 1777: elucidating the history of that country, and describing its productions … with an account of the Indians of Guiana, & negroes of Guinea, by John Gabriel Stedman (1806). Via Wikimedia Commons. Gender definitively influenced strategies of liberation. This was especially the case for manumission through military service, reserved to enslaved men. But this did not prevent some men to flee with their wife or family to the army that promised them freedom, as in the case of all independence wars—and women then performed labor for the army. Marronage to uncolonized territories also allowed more men than women (and more Africans than creoles) to escape from slavery. As a result, it was not rare for these maroons to kidnap women among Indigenous communities and enslaved plantation workers and forcibly settle with them. Manumission by self-purchase, however, was more accessible to women than men (and to creoles rather than Africans), especially in Spanish America and Brazil, where the law authorized slaves to purchase their freedom by laboring Sundays, holidays, and additional hours on top of long days in a master’s service. This female predominance was not the result of white masters manumitting their enslaved concubines or mistresses (as historians long assumed). It resulted from the fact that women were the majority of the urban enslaved population and worked in activities more likely to allow for the slow accumulation of the money necessary to buy their freedom—artisanal production, washing, cooking, street and market vending. In contrast, in rural areas, men predominated in the enslaved population. And there enslaved workers in farming and livestock industries were only able to buy their freedom on rare occasions by selling products they cultivated or raised. As for slaves in mining regions, access to manumission varied, being less restricted in the Colombian Chocó than in Brazil’s Minas Gerais, for example. Nevertheless, manumission by self-purchase was a process of many years that required planning and negotiation skills. But the fact that more women than men could buy their freedom contributed to the growth of free Afro-descended populations, as these women then gave birth to free children. 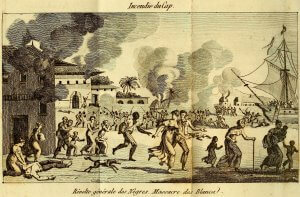 “Burning of Cape Français, General revolt of the Blacks. Massacre of the Whites,” Anonymous, circa 1815. Via Wikimedia Commons. Now that you’re done with your book, what books are you are you excited to read? First, I am happy to have more time to be outside, to walk along the river close to my home as the spring is on its way. I am also going to the cinema to immerse myself in fiction and documentary movies. But I have written this book on slaves’ self-emancipation not only to contribute to the historiography on slavery, but also because I am very concerned about the continuing effects slavery and exploitation. I have recently watched a poignant documentary on Kenneth Reams, an African American on death row in Arkansas since 1993 for a murder he did not commit, which shows his admirable resilience. I hope it can tour the United States and contribute to Reams’s liberation. I am also extremely worried about the rise of right-wing nationalism, authoritarian populism, racism, and hate across the world. I am planning to read more on the subject, for example The Spectre of Race: How Discrimination Haunts Western Democracy, by Michael Hanchard, and Against Hate, by Carolin Emcke. Our series of interviews with authors of new books in labor and working-class history continues. Laura McEnaney’s Postwar: Waging Peace in Chicago, is being released by the University of Pennsylvania Press today. McEnaney, a professor of history at Whittier College, answered questions from Jacob Remes.